Grover Norquist, head of the Americans for Tax Reform advocacy group, speaks at a session entitled ‘Scrap the Code: Towards Pro-Growth Tax Reform’ at the conservative Americans for Prosperity (AFP) ‘Defending the American Dream Summit’ in Washington on November 5, 2011. 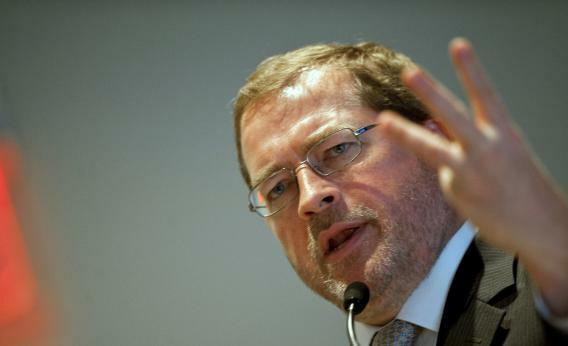 Grover Norquist, president of Americans for Tax Reform, is none too pleased. Norquist said Graham’s position that the GOP would need to compromise on income tax deductions makes it sound like he expects Barack Obama to win re-election. He said the Senator was making the same mistake Ronald Reagan made in 1982 and George H.W. Bush did in 1990: believing congressional Democrats who promise a ratio of spending cuts to tax increases, in this case four-to-one. “Pinocchio was told by the fox and cat that this would be” a good idea, Norquist said. He lampooned Graham for being disconnected from the reality of fiscal negotiations, comparing him to his three-year-old daughter. Norquist also discussed North Dakotans rejecting a ballot intiative yesterday to abolish the state’s property tax, expressing frustration with the local anti-tax movement for losing focus on income taxes, his bête noire. “It’s a train wreck and everybody jumped off the train,” he said, citing conversations with local activists and Tea Party members who were concerned the abolition of the property tax would put towns and cities, starved of revenue, at the mercy of the state government. “The good news is everybody says the obvious fix is to focus on the income tax,” which he predicted would be a goner in North Dakota by 2016.